With the holidays quickly approaching, electronics makers are rushing to unveil new products and pique interest in their brands. As worldwide PC shipments dwindle, tablets have become the hottest new piece of computing hardware. In the short existence of the modern tablet, myriad form factors, component combinations, and purposes have emerged. The compact seven-inch tablet – smaller than a traditional tablet, but larger than a smartphone – has gained increasing popularity. As far as Android-based tablets are concerned, Google’s own Nexus 7 is considered by many to be the gold standard. The 2013 version, released in July, was well-received by both critics and consumers. 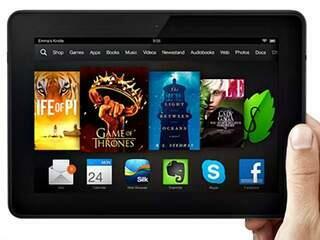 While not exactly powered by Android, Amazon unveiled the brand new Kindle Fire HDX at a press event yesterday. It boasts an array of major upgrades over the previous Kindle Fire HD and some brand new software features that have never been seen before – all for the same price as the Nexus 7. With two 7-inch tablets costing a wallet-friendly $229, holiday shoppers may have a difficult choice to make. But the truth is that these competing slates serve entirely different purposes. The size may be roughly the same, but the guts and intended user experience couldn’t be more different. First, let’s take a look at the actual size and weight of each device. The Nexus 7 is 7.9 inches tall by 4.5 inches wide and 0.3 inches thick. It weighs 0.69 lbs. The Kindle Fire HDX is 7.3 inches tall 5 inches wide and 0.35 inches thick. It weighs 0.67 lbs. That makes the Nexus 7 taller, narrower, and thinner – but still slightly heavier. It also creates a larger bezel around the top and bottom of the screen. Additionally, the Nexus 7 features a front-facing camera that is oriented to a portrait view, while the Kindle Fire HDX’s front shooter is oriented to a landscape view. Both display panels measure 7 inches diagonally, with identical resolution of 1920 x 1200 pixels and matching pixels per inch (PPI) of 323. Internally, the Nexus 7 features a 1.5 GHz Qualcomm Snapdragon S4 Pro with an Adreno 320 GPU and 2GB of RAM. It is offered with either 16 or 32GB of internal storage. This is where the Kindle Fire HDX blows the Nexus 7 away. It has a 2.2GHz Qualcomm Snapdragon 800 – the same CPU found in the LG G2 and Samsung Galaxy Note 3 – with Adreno 330 graphics. RAM and internal storage are the same, but the Kindle Fire HDX also comes in a 64GB model. While these tablets contain totally different guts, the software might be what sets them apart the most – surely, it dictates what kind of user will find one more attractive than the other. Google’s Nexus 7 runs stock Android 4.3 – no extra junk, no nonsense. On top of the vanilla OS is the fact that Google sends updates to Nexus devices before anyone else. “Nexus devices are synonymous with pure Google experiences. This is the chance for Mountain View to show off Android in its purest form, away from the meddling fingers of Samsung or HTC who just love to Sensify and TouchWiz up their devices,” said TechRadar. From developers to power users to the app-obsessed, the Nexus 7 is arguably the best “all-around” Android tablet on the market right now. The Kindle Fire HDX is made for reading books, listening to music, and watching videos. An updated version of X-Ray allows even deeper immersion into your favorite media. “X-Ray for music adds auto-scrolling lyrics to the song you’re listening to, and will even identify the song that’s playing in the show or movie you’re watching. It’ll give you trivia for whatever you’re watching, backstories for the characters, and all the other information Amazon-owned IMDb can provide,” said The Verge. The Kindle Fire HDX also gives users who have subscribed to Amazon Prime the option of downloading and storing videos to be watched offline. Videos can be stored for up to 30 days and expire 48 hours after the user presses play. Unfortunately, this option doesn’t support all of the Prime Instant shows and movies – but more and more titles will likely be added down the road. There is one negative quirk associated with all Kindles – “Special Offers.” These are ads that display on your screen when the device is turned off. Some people find them easy to ignore, but others opt to pay a $15 fee to remove them from their device. For beginners, the Kindle Fire HDX may be the best option on the market, period. A new function called MayDay gives users free 24-hour video support from an Amazon support representative. Not only can a user ask questions about how to perform a certain function or task, but the MayDay support staff will be able to control the device remotely if a user is struggling with the directions. The Kindle Fire HDX may have better specs at the same price point as the Nexus 7 – but for someone who wants a well-rounded tablet that is free from the clutter of third-party “skins” and unnecessary apps, Google’s slate is hard to beat. If your primary reason for owning a tablet is reading novels and staying current with your favorite TV drama, nothing even comes close to the Kindle Fire HDX. Amazon forgoes making a profit on the device itself because the Kindle Fire HDX has one purpose – consuming copious amounts of media. Fire OS is easy to navigate for noobs, and the MayDay panic button will ensure that even grandma can use it with ease. One final consideration: 4G LTE connectivity. The Kindle Fire HDX will cost an extra $100 for wireless data, while the Nexus 7 adds the service for $80. The Nexus 7 is available now, and the Kindle Fire HDX will begin shipping in October. The online retailer also introduced a 24-hour virtual help desk called MayDay.